If you haven't already, download the Meetingbird extension for Chrome (https://chrome.google.com/webstore/detail/meetingbird-meeting-sched/joheckceackgilmpkgcihjfgggbnejcg?hl=en) and follow the instructions for signing in or signing up for an account. Meetingbird supports both Google and Office 365 calendars. Log into your Re:amaze account at (https://www.reamaze.com/admin) in Chrome and log in. Click the Meetingbird icon in the Chrome toolbar to open the Meetingbird integration for Re:amaze. 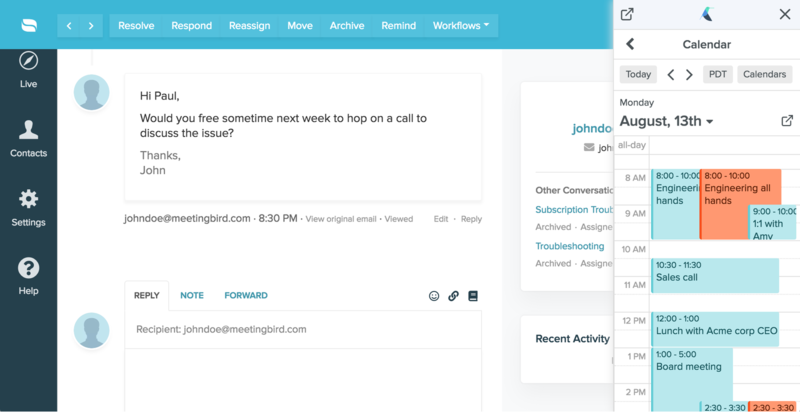 From here, you can manage your calendar, insert meeting times into email replies, and access scheduling links. Meetingbird makes it easy to view your calendar and create new calendar events. This is useful if you need to check when you're available for a meeting or if you already have a meeting time in mind and want to add the event to your calendar. If the Meetingbird sidebar isn't open already, click the Meetingbird icon in the chrome toolbar. Click the "My calendar” button. You'll see your calendar appear. Click anywhere on the calendar to create a new calendar event or click an existing event to view event details. Click the blue "Schedule" button to create the event and send calendar invitations to all attendees. Click "Insert Meeting Times". A popup will open that displays your calendar. Mark any times that you're available for by clicking and dragging on regions of the calendar (for example, 2pm-4pm on Thursday). Use the sidebar on the left to optionally customize the meeting topic, duration, location, and more. Click the blue "Insert Meeting Slots" button and close the popup. 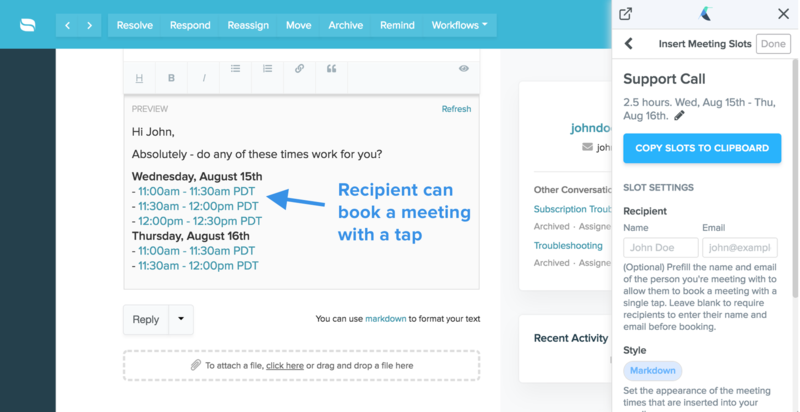 You'll now be prompted to copy the meeting slots and paste them into your email. Before copying, use the list of settings to customize the Timezone, and Time Format. Copy and paste the slots into an email reply . Since Re:amaze's email composer uses markdown, the slots are pasted using markdown format. Just click the preview icon to see how the time slots will appear to the recipient. The recipient will be able to book a meeting by simply tapping a time slot.